Discrete GPUs that are competing against graphics titan Nvidia. The heart of every Vega card. When I compared the Vegas to the 1080, what I found was far less exciting that what I’d hoped for. While the AMD Vega 64 was, on occasion, faster than the 1080, it never blew my hair back. Instead it was sort of like going to the car lot and having to choose between a Honda Civic or a Toyota Corolla. They’re both very nice, cost the same, and do the same damn thing. What was really astounding was the performance of the $400 AMD Vega 56. Despite being considerably cheaper than both the Vega 64 and the Nvidia 1080, it played Overwatch and Civilization VI only marginally slower. The 1080 managed 112 frames per second playing Overwatch on Ultra at 4K, the the Vega 64 did a slightly faster 114, but the Vega 56 pulled of 99 frames per second at 4K with the graphics cranked to Ultra. That’s not just a little respectable, that’s really damn good. In Civilization VI the difference was even smaller, with the Vega 56 only taking about 1.5 milliseconds longer between frames than the 1080 or Vega 64. In one case the Vega 56 did even better than the $500 Nvidia 1080, and was on par with the more expensive Vega 64 too. When I rendered a frame in Blender, graphics software that allows you to create large 3D images that heavily tax a discrete GPU, the Nvidia 1080 took 9 minutes and 34 seconds. The Vega 64 rendered the same frame in 9 minutes and 28 seconds. 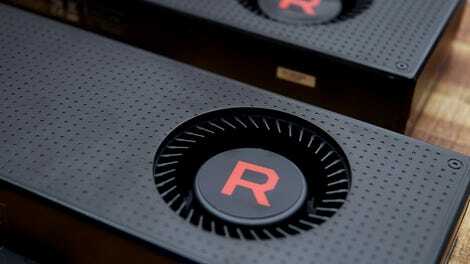 The Vega 56? Just 9 minutes and 29 seconds. With that kind of neck and neck performance there’s no reason to really buy either a Nvidia 1080 or Vega 64 over the Vega 56. But speed isn’t the only factor to consider when buying a discrete graphics card. See, the cards that go in your desktop PC are very power hungry. If your power supply can’t provide enough juice, the GPU is worthless, and that is one place Nvidia performs far better than AMD every time. The Nvidia 1080 demands 180 watts of power to run. The Vega 56 requires 210 watts, and the Vega 64 requires a whopping 295 watts. Two 8-pin power connectors feels a little power hungry. All the extra juice means you have to use not one, but two 8-pin power connectors from your power supply. The Nvidia 1080 requires just one 8-pin power connector. With the new Vega cards AMD is trying to get around the power constraints of it GPUs by offering some software solutions. The first, and most notable, is the Radeon Chill feature, and it’s actually sort of clever. It operates under the assumption that people don’t really need the fastest video card, they just need one fast enough for their monitor. Both AMD and Nvidia have a technology that allows cards to “sync” with monitors to deliver top-level graphics without straining the GPU (Nvidia calls its tech G-Sync, while AMD calls it FreeSync). Both cards have three DisplayPorts and one HDMI port. But you have to have a special monitor that works with the syncing technology and no monitor works with both the AMD and Nvidia sync tech. Radeon Chill works with any monitor. You simply tell it how many frames you actually want to see per second. Got a monitor that refreshes 60 times a second? Set the max to 60 frames per second and Radeon Chill makes magic happen. In addition, the software doesn’t try and churn out 60fps if nothing is on screen. Instead it recognizes moments with static visuals and dramatically cuts down on how much power is being used—and you can tweak the number as well. Want it to never go below 30fps? Just set the slider in the AMD software. AMD added other software features that give users a better ability to throttle their cards without diminishing visuals. There’s a power saver mode which allows you to force the cards to sip as little as 150 watts; a Frame Rate Target Control mode that lets you cap the frames per second; and an Enhanced Sync mode that figures out the optimal frame to display on screen, even if it means skipping a few other frames. All these features make the AMD Vega cards feel incredibly practical versus the excess and overclocking shenanigans of Nvidia. It’s as if AMD is trying to say “if you want nose bleed speed go with Nvidia, but if you want control and a nice experience join us.” That’s a reasonable sale to an old woman such as myself. I play my games on 4K TVs that have no syncing technology (though Microsoft suggests that could change next year) and can only show between 60 and 120 frames a second. I don’t need dual video cards or crazy numbers, I need good enough. And the AMD Vega 64 and AMD Vega 56 are good enough. If you’re looking for a reasonably priced card the AMD Vega 56 is a fantastic choice. But these cards aren’t enough to lure Nvidia loyalists or the power hungry away. As the latest salvo in the war between Nvidia and AMD goes, the new Vega cards are pretty weak. These cards are neck and neck with the $500 Nvidia 1080 in the speed department. But they natively draw a lot more power. 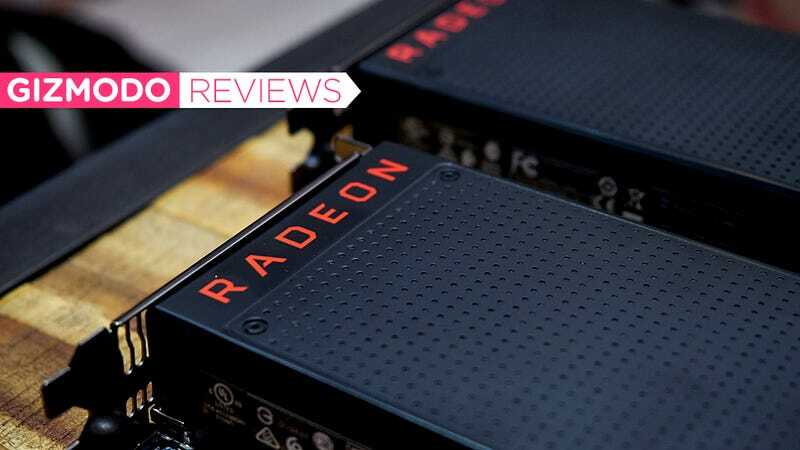 A bevy of software features try to resolve the power issue, but it means you’re effectively throttling your shiny new GPU.